I have compiled a list of named peaks in ACT above 1700 meters. There are 13 of them. And I have climbed them all ... Yay ! 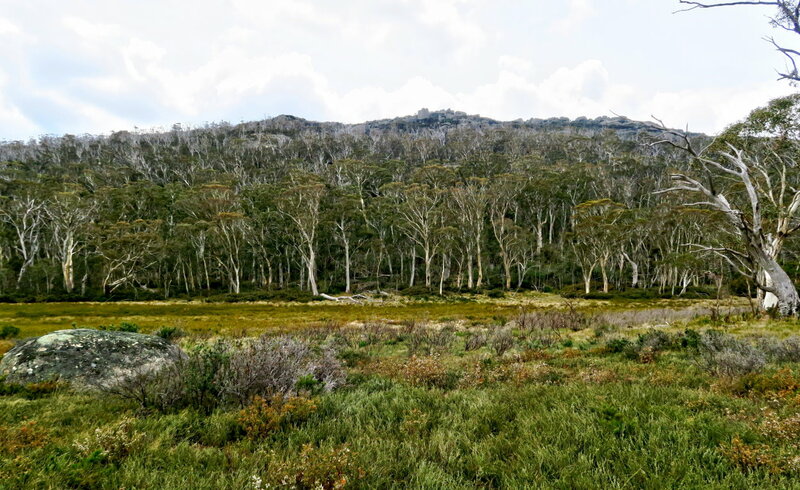 Trip report is under construction..
Today's climb, with BR, is to Mt Namadgi, 1791 meters. In my list above, it is the 6th highest named peak, and one of the remotest mountains in ACT. The view from the summit is excellent. But to get there is not so simple ... this trip costs us 19.5 hours !!! One reason we took so long was because on the return leg, from 8pm to 1:30am, we were in the middle of the night, bushbashing in the dark in dense bush. But even if we had total daylight, we would still require about 16 hours. So, with hindsight, we took the trip too leisurely earlier on, should have bushbashed much faster in the morning. This was the first time I went on a climbing trip without taking enough batteries for my GPS ... well, I didn't anticipate the trip to take 19.5 hrs. I had expected a regulation climb of 11 hours only. Also, I expected BR to bring his own GPS ... but his GPS was broken in an earlier trip. To conserve power, I turned off my GPS on the return trip. Fortunately, BR is a good navigator and was able to guide us down the mountain, even in complete darkness and in the bush. Only occasionally did I need to turn on the GPS for a minute or two to confirm our positions. But still, without a GPS, we were a bit slow. On two occasions, we even went backwards while in the dark. Lessons learnt: Always bring enough batteries for the GPS to last 24 hours ! 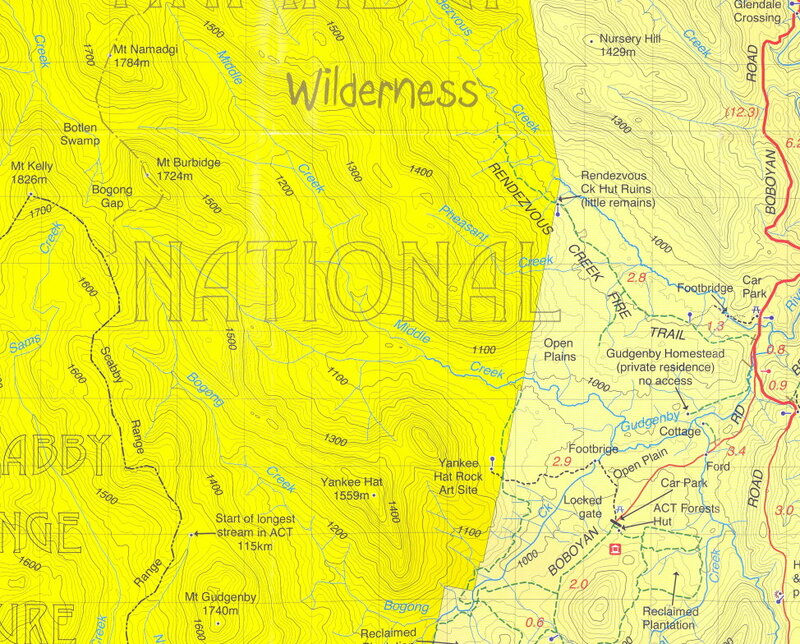 The below map is from the 1:50,000 scaled Rooftop's Namadgi map. - Where Yankee Hat is in the map, it should be an unnamed 1558-meter hill. - Yankee Hat itself should be at the next hill to the north-east. The starting point of the Mt Namadgi climb is at Yankee Hat Carpark on Old Boboyan Rd. If you are coming from the direction of Canberra, drive south on Boboyan Rd. At about 0.7 km pass the bridge crossing Rendezvous Creek, or 0.3 km pass the bridge crossing Gudgenby River, watch out on your right for a fork with a very small sign pointing to Yankee Hat Carpark & Old Boboyan Rd. You really need to watch out for it, as one blink and you'll miss it. • Start at Yankee Hat carpark. • Once we pass the open plain and into the scrub, keep to the north side of Middle Creek. 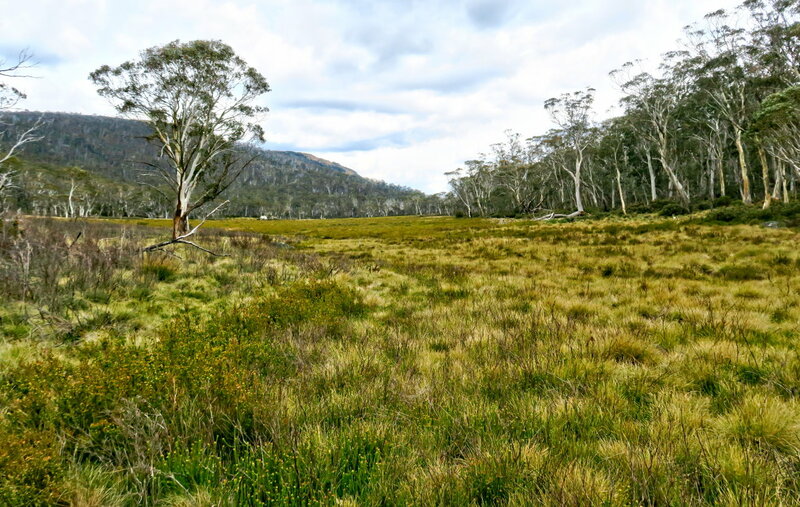 • Walk to Big Creamy Flats until we are north of Mt Namadgi. • Return trip is to retrace our steps back to the car. 20:05 22.2 km (Sun sets at 19:37. Last light at 20:05.) From now on, we are totally in the dark. 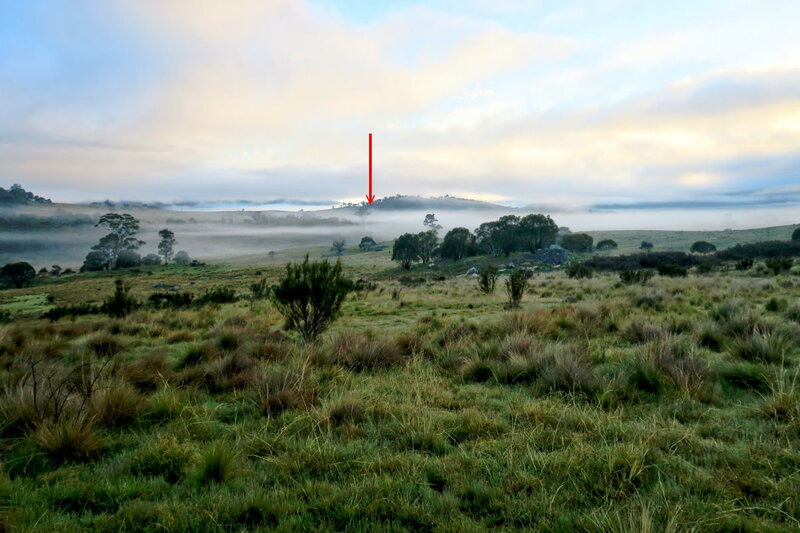 - Red arrow points to mist covered Yankee Hat. - Blue arrow points to the valley through which Middle Creek flows. 3) In the 2 pics below, note the change in colour within 15 minutes! 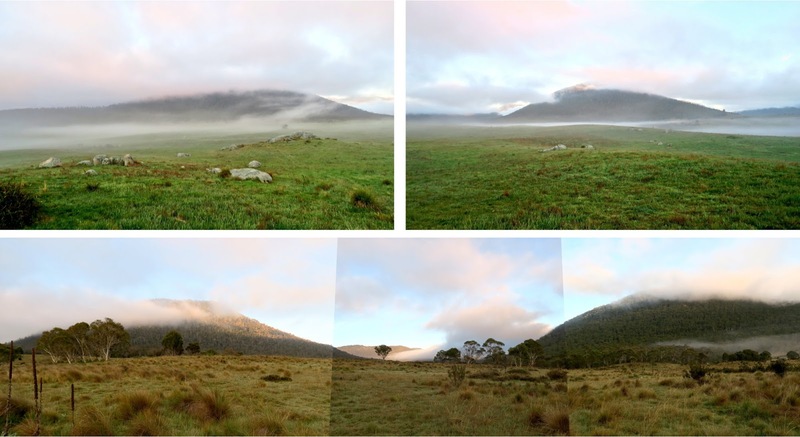 The upper photo is taken at at 6:15am. - The hill on the left is Yankee Hat. - The valley in the middle is where Middle Creek flows. 5) After an hour of walking in the open plain, it is bushbashing time. 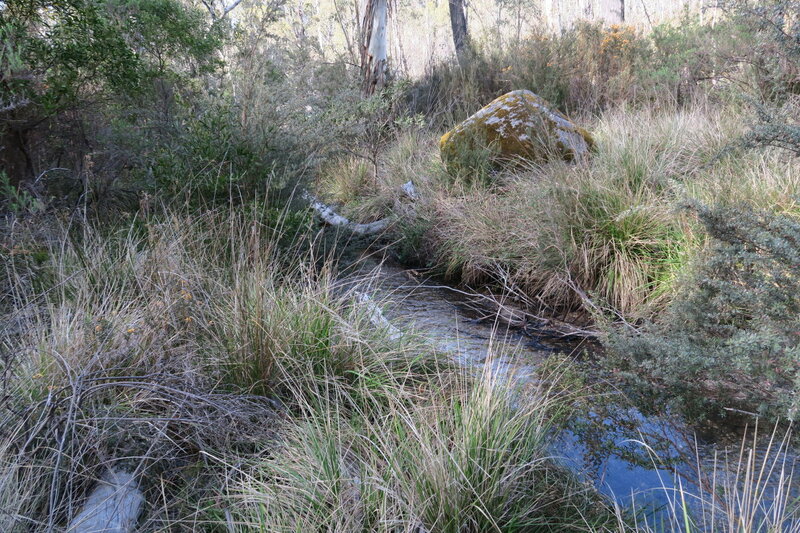 6) A creek to cross ~~~ this one flows into Middle Creek. 8) 7.8 km, 2 hrs 40 minutes after we started walking, we get our first glimpse of Mt Namadgi. 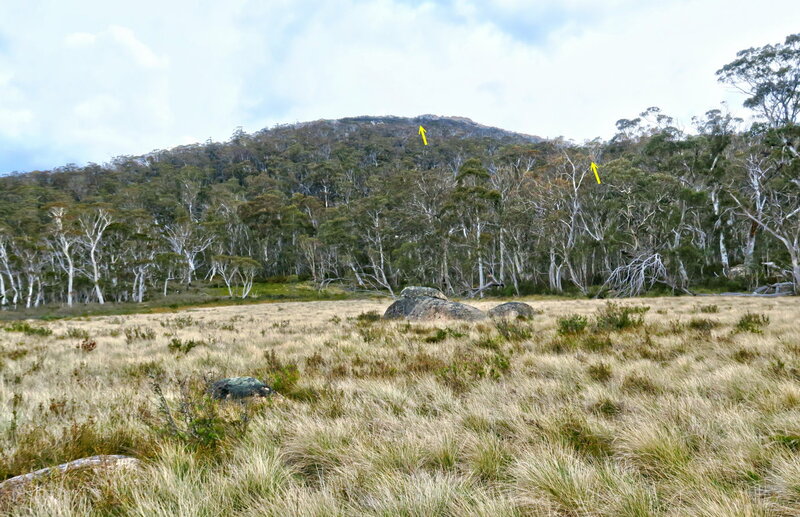 - The right arrow points to Mt Namadgi obscured by the gum tree. 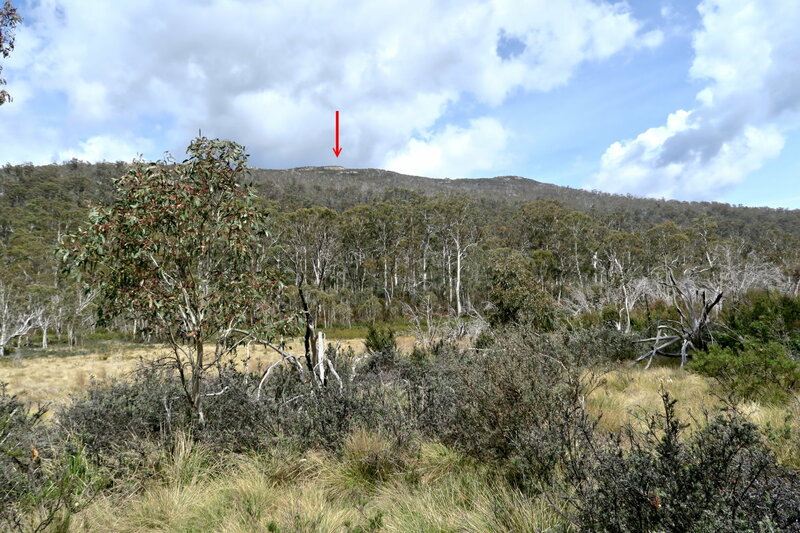 We are due east of Mt Namadgi - red arrow in the pic. However we won't climb Mt Namadgi yet. We'll keep going north-west to Big Creamy Flats. Mt Namadgi is not in this pic. It is just outside the left edge of the pic. 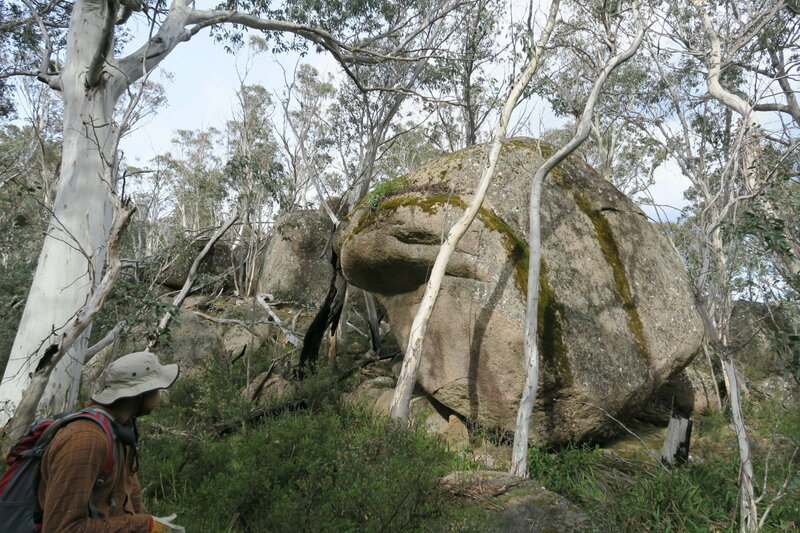 We are at the north-east side of Mt Namadgi. The summit can't be seen yet. In the pic, it is behind the rocky cliff at the top of the ridge. 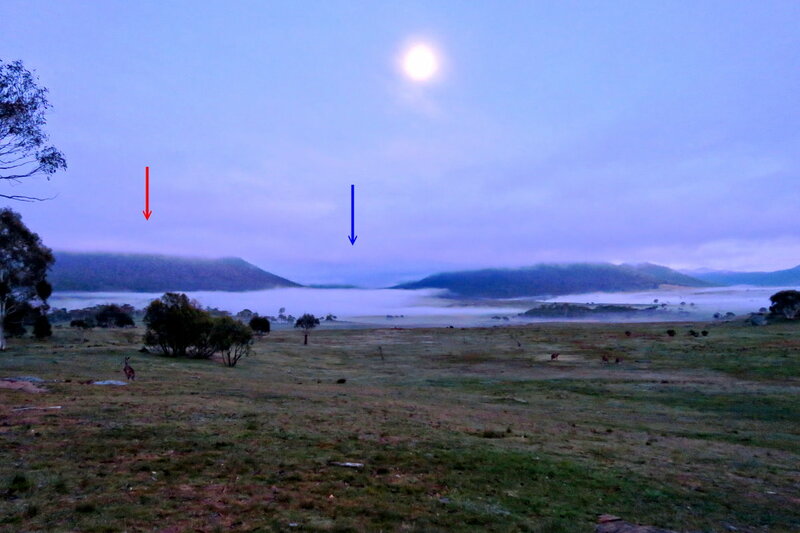 12) Still at Big Creamy Flat, looking directly east at the 3 peaks of Mt Mavis. (The summit is the peak on the right.) At this point, I realize I have to ditch my grandiose plan of climbing Mt Mavis after climbing Mt Namadgi ... it is already past 12 o'clock (more than 6 hrs of walking) and we have yet to climb Mt Namadgi ! At 12:30pm, we have lunch by the edge of Big Creamy Flats. Afterwards, it is straight up towards the summit. 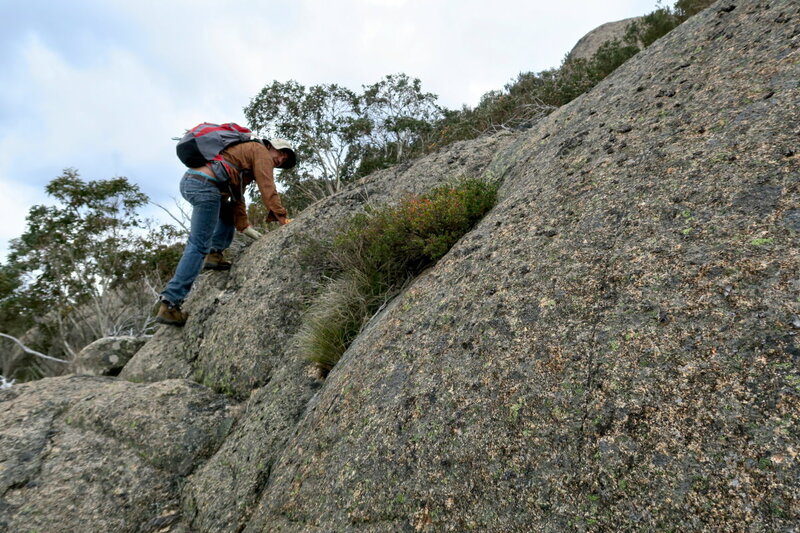 14) BR climbing up a rock face - we are half way up the slope of Mt Namadgi. 15) These are the rock cliffs that is at the top of the mountain in Photo #11. 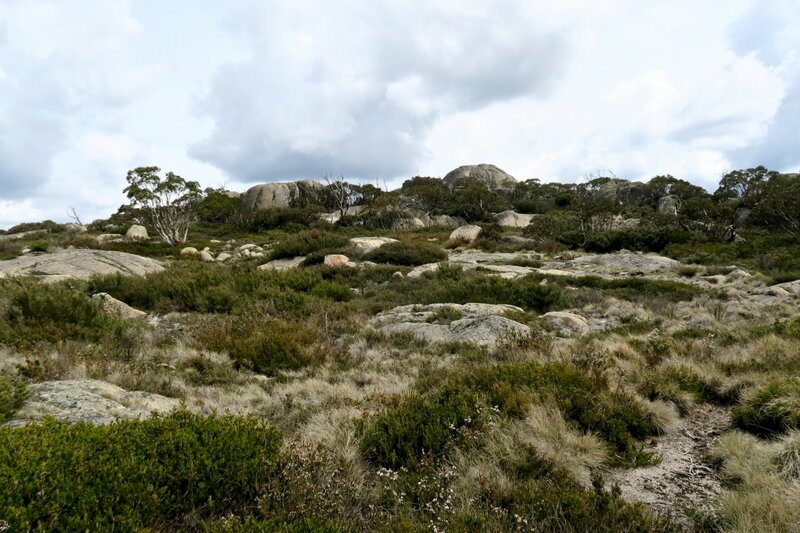 The Namadgi summit, which can't be seen here, is another 500 meters behind the cliff. We'll climb up the rock cliff through the crack pointed by the yellow arrows. - Big Creamy Flats can be seen below. 17) After we climbed over the rock cliff in Photo #15, we can see the summit - top of the rock in the middle of this pic. 18) Hurray! 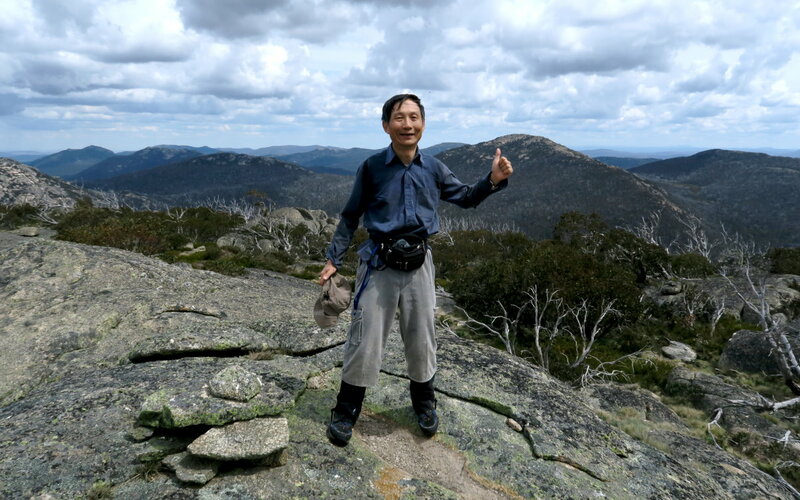 At Mt Namadgi summit 1791 meters, 14.4 km, 8 hrs 40 minutes after we started from Yankee Hat carpark. 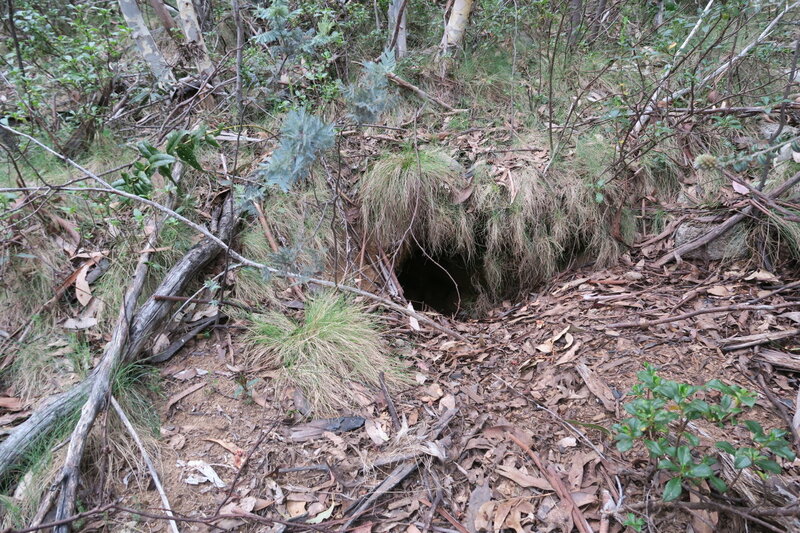 Hhmmm ... we now realize a large chunk of the return trip will be bushbashing in the dark ! My thumb is pointing at Mt Kelly. Mt Kelly is the big mountain in the centre of the pic. - Yankee Hat carpark (blue arrow) ... where we started the walk this morning. - Mt Burbidge ... Climbed it and Mt Kelly with RE in early January this year, 2015. - Mt Gudgenby ... Will climb it with DH in Nov 2017. - Mt Kelly ... Climbed it and Mt Burbidge with RE in early January this year, 2015. - Mt Morgan ... on my to-do list. 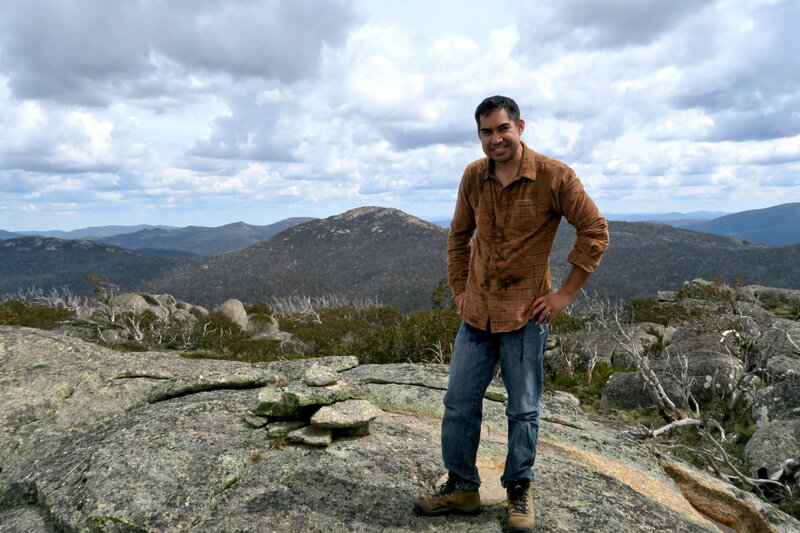 - Mt Murray ... 3rd highest mountain in ACT ... on my to-do list. - Bimberi Peak ... climbed it with RE from the east in Jan 2011. 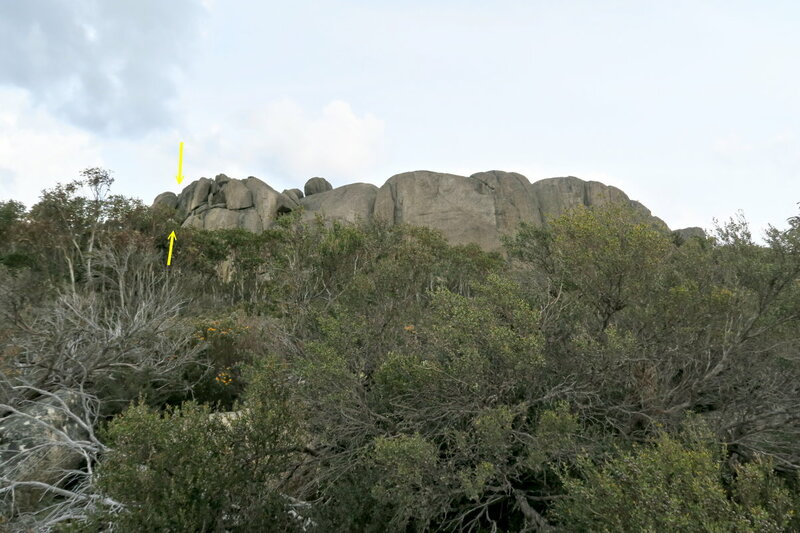 - Cotter Flats (blue arrow) ... RE and I camped out there for the night after climbing Bimberi. Fortunately BR has a good sense of direction. So I turned off my GPS and let BR guide us back to the car at Yankee Hat Carpark. At 8pm we've covered half the distance. 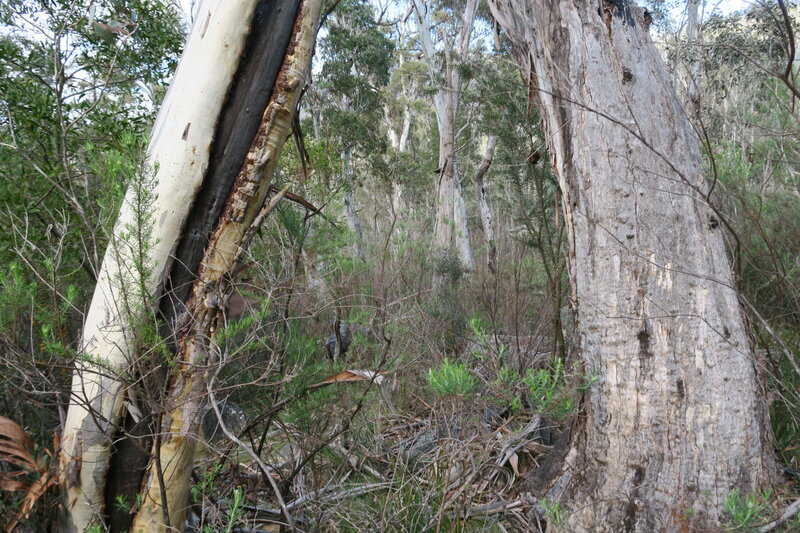 As the sun sets at 7:37pm and last light is at 8:05pm, so the last half of the walk is bushbashing in complete darkness. In the end, we reach the car at 1:32am in the middle of the night ... making it a total of 19 hrs 40 minutes for the day ! - The kangaroos were in plague proportion in ACT. On the way back to Canberra from Yankee Hat carpark (where we started the walk), kangaroos jumped in front of my car on 3 occasions. Fortunately I had the foresight to drive at 50 kph in a 100 kph zone and was able to stop the car in time. Had I bump into one of roos at full speed and badly damage the car, I don't think I can get any help as there was no mobile phone connection in that remote part of ACT.